A picture is worth a thousand words. 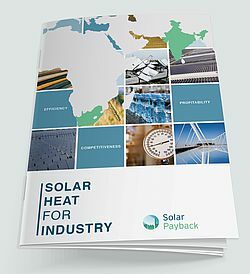 So we used a lot of pictures in the info brochure “Solar Heat for Industry” to illustrate stakeholders from industry, financial sector and policy the powerful resource and the huge potential of solar heat technologies in manufacturing businesses. You find statements of satisfied investors in the 20-page booklet and easy to understand hydraulic schemes of the different integration options of solar heat technology in production processes. Download the brochure in English, in Spanish and in Portuguese and use it in your communication with clients and decision makers. solrico in cooperation with the German Agency Matters and the Mexican design agency Laca was responsible for the content and the design of the info brochure which is the first publication of the international project Solar Payback, which aims to increase the use of industrial solar heat in four partner countries: India, South Africa, Mexico and Brazil. The project is coordinated by the German Solar Association BSW-Solar and financed by the International Climate Initiative of the German Federal Environmental Ministry.